In my new novel, The Merlin’s Wife, I based the manuscript that John Dee is determined to decipher on The Voynich Manuscript. This book is hand written on vellum. It has no title and no author is credited. It contains over 200 pages and is divided into sections, apparently dealing with herbs, astronomy/astrology, biology and medicine. 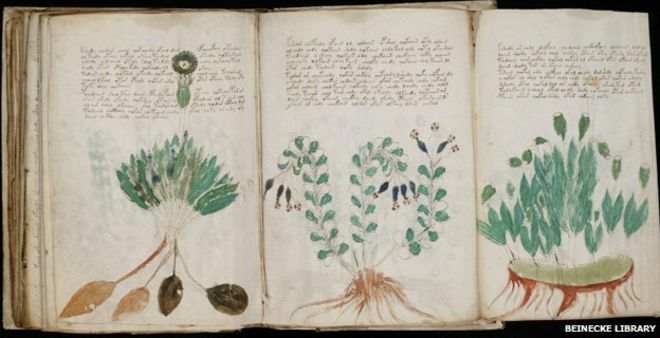 Almost all the pages are illustrated with many detailed drawings of plants, stars and possibly alchemical secrets, but the neat text is in a language that no one understands. It has been described as the most mysterious manuscript in the world. It was bought by an antique book dealer named Wilfrid Voynich in 1912, although his acquisition of it is clouded in secrecy. 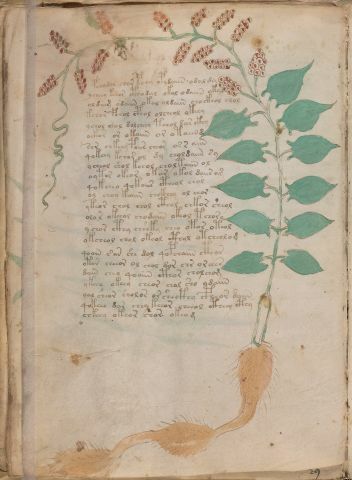 Voynich said that it had been found amongst other illustrated manuscripts in a chest in a castle in southern Europe, but a letter written by his widow, Ethel Lilian Voynich, in 1930 mentions that it was once the property of the Vatican. One clue to its history is a letter discovered inside the book. It is from Georgius Barschius of Prague, to the Jesuit Athanasius Kircher in Rome, telling him that he owned a mysterious book that was written in an unknown script. He hoped that Kircher might be able to translate the book and sent him copies of some of the pages. The Prague physician and scientist Johannes Marcus Marci was also a correspondent of Kircher and before his death he sent the full manuscript to him, explaining that he had inherited it from a close friend, who had tried to decipher it until the end of his life. He also says that he learned from one ‘Dr. Raphael’ that the manuscript had been bought by Rudolf II of Bohemia (1552-1612) for 600 ducats, and it was believed that it was written by Roger Bacon (the Franciscan friar who lived from 1214 to 1294). The vellum the manuscript is written on has been carbon dated to the 15th century and so that rules out authorship by Roger Bacon. 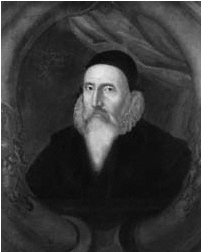 However, the story that it was once owned by the Emperor Rudolf has given rise to a theory that the manuscript is actually a hoax and that it was written either by John Dee or, more plausibly, by his assistant and medium, Edward Kelley, when they were living in Prague, working on their alchemical experiments. Kelley is a major suspect, as many regard him as a charlatan who tricked John Dee, Emperor Rudolph and many others with claims of his abilities. So, who wrote it? Does it have meaning? Will anyone ever manage to decipher it? These questions still have no clear answer and the meaning of the manuscript remains as elusive as ever. In The Merlin’s Wife, John Dee believes that the manuscript is written in the lost language of Enoch and he and Kelley attempt to solve the riddle through their conversations with the angels. I won’t spoil the story by revealing any more! You’ll have to read the book.